What is PASHA® Electrode treatment of backpain? What are the advantages and risks of PASHA&REG; Electrode treatment? When is a PASHA® Electrode treatment an effective option? How does the PASHA® Electrode work? Back pain can not always be treated causally. In some cases, pain in the spine is still very strong despite conservative therapy or pain medication for more than 3 months. Furthermore, permanent administration of high doses of painkillers often becomes in and of itself a health problem. We can directly help patients by means of a specific minimally invasive pain therapy: so-called neuromodulation through the PASHA® Electrode. What is a PASHA® Electrode? By inserting an electrode into the spinal area of the central nervous system, pain transmission into the brain can be permanently altered. This process is called neuromodulation and is free of side effects. The PASHA® Electrode is a minimally invasive pain therapy that acts by permanently influencing the nerves in its vicinity through electromagnetic fields. It causes a permanent change in pain signal transduction that lasts from months up to two years. This permanent change in signal transmission is caused by several bursts of electromagnetic impulses caused by the PASHA® Electrode. This treatment is also called Epidural Pulsed Radio Frequency therapy (EPRF). This electrode is attached to a flexible tube ("catheter") that also allows the application of pain medication and anti-inflammatory drugs in the vicinity of irritated nerve roots. The common name for this EPRF therapy (PASHA® Catheter) is derived from the inventor of this method: Neurosurgeon Dr. med. Omar Pasha. It is inserted through a cannula - no stitches are required. No scarring near the spine. No nerve damage as well as no numbness due to the current pulse. Permanent pain reduction for 1-2 years. The patient can be spared the risk of high doses of pain medication. Multiple pain-centers in the spine can be treated as part of a treatment. PASHA® Catheter therapy can be combined with the local infiltration of anti-inflammatory and analgesic drugs. For which conditions is PASHA® Catheter treatment useful? Diseases of vertebral joints lead to 60% of all painful conditions in the body. The intervertebral discs, the nerve roots and also the small vertebral joints are involved. The back pain is caused among other reasons by intervertebral disc degeneration, postural abnormalities or lack of movement and excessive sitting. The pain caused by nerve root compression or arthritis of the small vertebral joints (facet joints) arise in particular segments of the spine. By performing a thorough neurosurgical clinical diagnosis we can identify the vertebrate segments responsible for this pain. Back pain can occur acutely or - after more than 12 weeks - as a chronic condition. Acute back pain is usually treated conservatively with physical therapy, exercise or with a variety of painkillers. Depending on the cause of the pain, surgical treatment or pain therapy with the PASHA® Electrode can be a useful solution after chronification of back pain has already occurred or acute pain can not be treated in any other way. Neuromodulation with the PASHA® Electrode is very specific and acts directly on the nerve fibers involved in the transduction of pain signals. The electrodes are attached to mobile tubes (catheters) with a very thin diameter. Through the Epidural canal in the spinal cord the electrode is navigated to the area responsible for the back pain. In conventional methods of electromodulation of nerve fibers, the affected segments are directly accessed by rigid needles through the skin. Other alternative pain therapies rely on permanently implanting a needle in the vertebrate spine. This is not required in the case of PASHA® Catheter treatment: With the PASHA® Catheter we reach a long-term result of one to two years with clear pain relief by means of a one-time neuromodulation treatment. How does the PASHA® Catheter work? The principle of the PASHA® Electrode is not completely clarified. Strong electromagnetic fields in the vicinity of the nerve fibers cause permanent chemical changes of the neural axons, which no longer transport this pain information into the brain. The observed pain relief lasts at least one year, often longer. During this time the patient has the opportunity to lay the foundations for a further improvement of well-being by changing their way of life as well focusing upon the movement and training of the back muscles. The PASHA® treatment may also be repeated after some time, after the effect has diminished. Electromodulation of pain transduction can be combined with the local application of anti-inflammatory agents and pain medication through the PASHA® Catheter. This is a very effective principle of pain therapy: without strain on the organism, a high dose can be applied locally at the source of the pain. Therefore, the PASHA® Electrode is very suitable for the treatment of acute pain conditions and inflammatory irritation of the nerve roots. The surgical risk is very low. The procedure is minimally invasive and does not lead to tissue scar formation in the vicinity of the sensitive spinal cord. The efficacy of neuromodulation is very high for patients for whom it is appropriate. By undergoing EPRF pain therapy patients can avoid a lengthy, frequently stressful pain therapy that includes medical pain killers. The efficacy is very high after correct preliminary examination: 70% -80% of all treated patients experience a permanent improvement of their pain situation after correct pre-diagnosis. This makes EPFR one of the most successful surgical therapies for back pain. Risks of the PASHA® Catheter? The method of neuromodulation using the PASHA® Electrode is one of the most minimally invasive procedures to treat back pain. The operation is carried out without skin and tissue incision, only requiring the use of a hollow needle. Nevertheless, it is an invasive operation at the spinal cord. This procedure must be carried out in a sterile surgical room, if possible by a specialist for neurosurgery. There are the usual risks for endoscopic procedures, e.g., the infection or the injury of nerves. In order to justify these risks, the pain therapy with the PASHA® Electrode is used only when all other conservative pain therapies are exhausted. Overall, the surgical risks associated with endoscopic surgery are very low, because the cannula, which is easy to place, does not injure nerves. Infections are very unlikely due to the lack of incisions and subsequent wound healing. One of the most important but rare side effects is an injury to the hard dura mater, the so-called meninges or cerebral mebrane in the spinal cord surrounding the central nervous system. In order to circumvent this side effect, we always select the access point at the level of the sacral hiatus, the area below the lumbar vertebra. The spinal cord has no dura mater in this area. The PASHA® multi-function electrode is navigated precisely to one or more areas where pain is triggered. Being placed at the front end of an elastic tube the flexible catheter is navigated through the spinal canal via x-ray supervision, in realtime. The neuromodulation which occurs using PASHA® does not - as opposed to denervation methods of PAN therapy - destroy any nerve tissue by heat. In a gentle way, it permanently changes the signal propagation of the neural pathways. The magnetic field of a pulsed radio frequency is applied directly to the affected nerve tracts over a period of four to seven minutes. The PASHA® Catheter is therefore also referred to as an epidural pulsed radio frequency treatment (EPRF). PASHA® Catheters can potentially treat all areas of the spine: the cervical spine, the thoracic spine, the lumbar vertebral column, and the sacral vertebra. Nerves that are treated with the PASHA® Catheter are not damaged because there is no application of heat, as there is with other radio frequency therapies. Thus, there is no resulting numbness or deficit of feeling in certain areas of the body. Indication: Which diseases can be treated by the PASHA® Catheter? The PASHA® Catheter is a flexible pain therapy: it can be applied to various pain causes. In principle, certain acute states of the vertebral column generally do not require causal therapy, because they spontaneously dissolve after only a few months. The most important example for one of these conditions is the herniated disc. A pain therapy such as the PASHA® Catheter is suitable to provide the necessary time to quickly and painlessly relieve the patient from acute pain. The operative removal of the intervertebral disc disease can be avoided and left to the natural process wherein the body itself absorbs the disc material. The small vertebral joints connect the extensions of the vertebral bodies forming the spinal canal. These extensions are connected to the vertebral bodies above and below the facet joints. These facet joints can develop arthrosis and become very painful. The spondylophytes (bone spurs), which are formed because of facet articular arthrosis can narrow the exit points of the nerve roots in the spinal column (nerve root stenosis). This facet joint articular arthrosis can cause chronic back pain in several ways. Nerve fibers and nerve roots can be chemically irritated by the protruding material from the inside of the spinal disc. This can be very painful. This acute pain can be treated by neuromodulation with the help of a PASHA® Catheter. In microsurgery, scar formation can occur in the vicinity of the vertebral column. Such a scar can lead to a permanent nerve irritation, a so-called postnucleotomy syndrome. This pain can also be treated by neuromodulation with PASHA® Catheter. 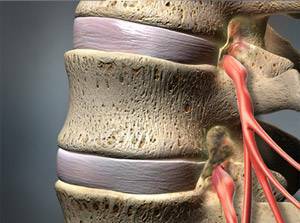 Chronic pain can be caused by a compression of the spinal canal. In most cases, a conservative therapy with a through physiotherapy is aimed at treating spinal stenosis in a targeted manner. In severe pain, treatment with the PASHA® Catheter can lead to faster pain relief. Local anesthesia - no intubation required. Endoscopic access - no scar formation. No stitches, therefore no healing complications. Neuromodulation by radio frequency therapy is performed under local anesthesia. The patient is awake and responsive throughout the procedure. Intubation of the patient (laying of an air hose) is not required during local anesthesia. The typical risks of anesthesia are thereby circumvented. The patient is treated in a face down position. The location of the needle is controlled under X-ray vision. The spinal canal is accessed via a needle through the skin. The area is of course disinfected before the procedure. 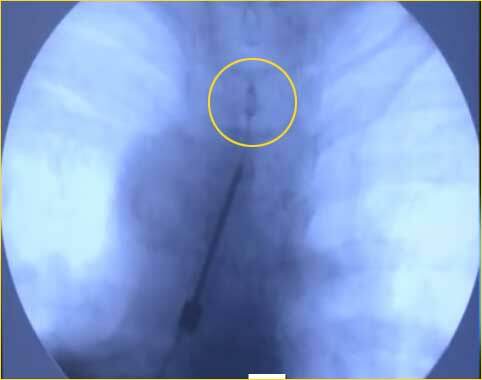 Under X-ray control, this needle is inserted into the epidural canal, which surrounds the spinal cord. When the epidural canal has been reached, the electrode attached to the PASHA® Catheter is inserted through the needle. The tube to which the electrode is attached is soft and mobile. The electrode tip can be located using the X-ray machine. The segment of the spine which is responsible for the chronic pain can now be controlled through the epidural canal. The proximity of the electrode to the target nerve is controlled by small electric current surges. At low current levels, the patient feels a slight tingling sensation in the area where the tip of the catheter is localized. It is very important to carry out this test so as to ensure that EPRF treatment actually covers the area causing pain. This control of the position of the electrode by the feedback of the patient also takes place during the actual pain treatment: the patients report a pleasant feeling of warmth during the application. In the actual PASHA® Catheter treatment with a pulse current at considerably higher current intensities, chemical changes are caused to the nerves in the vicinity of the electrode, which permanently reduce the pain signal conduction in the central nervous system. The temperature in the vicinity of the electrode increases to 42° during the pulse treatment. This is not dangerous for the nerve tissue. The patient experiences this treatment as a warm feeling in the treatment area. The duration of the treatment is about four to seven minutes per segment. In one session, several painful sites along the spine can be treated. After treatment in one area, the probe can be navigated to another area, which also triggers pain, and the treatment is performed there again with the same PASHA® Electrode. Thus, no further application of a puncture needle is necessary. This is very gentle for the patient. When all pain centers are treated, the needle is removed along with the PASHA® Catheter. The entrance must only be covered with a bandage, stitches are not required. If necessary, this treatment can be combined with the application (infiltration) of anti-inflammatory and analgesic agents in this area. These substances are also applied through the catheter which is already in place. Immediately after the treatment, only 10% of all patients have an improvement in their pain perception. In most patients, it takes up to three weeks for the PASHA® Catheter treatment to be fully effective. Approximately 70-80% of all patients experience significant, lasting pain relief. If we want to combine electromodulation with a drug therapy, which is often useful when inflammatory processes or scarring are treated, the patient has to remain stationary for two nights. The catheter is then not drawn after the treatment, but is connected. On the following day, the catheter is used to inject a further dose of painkillers and anti-inflammatory drugs to take advantage of any therapy mode.